We hold sporting contests to make a difference to young lives. Win4Youth is a global sports and CSR programme organized by The Adecco Group to raise funds for charity. We convert every kilometer and minute into donations for supporting abandoned, orphaned or sick children and helping families from disadvantaged communities. Adecco’s colleagues participate in sporting challenges and involve clients as well as associates to follow so that together, we can make a difference to young people around the world through this programme. Since the programme began in 2010, colleagues have taken part in running, cycling, swimming and triathlon highlight events. Now celebrating its 9th year, the 2018 programme will allow for participation in more sports such as yoga, soccer or badminton and concentrate on achieving the ambitious goal of 8,000,000 KMs & 438,000 hours. Are you having trouble finding the ideal job or internship? Is your lack of experience working against you? Do you feel like you need to revamp your job search approach? Many students and recent graduates are in this situation, and we’re here to help with the exciting and new Adecco Way to Work programme. The Way to Work career programme was introduced in 2013 to tackle youth unemployment and skills shortages, develop young people’s employability and help them enter the world of work and help students and recent graduates find desirable job opportunities and internships and prepare them to get hired. The fast-growing career programme is built around distinct components — CEO for One Month internship and Adecco Experience Work Day. 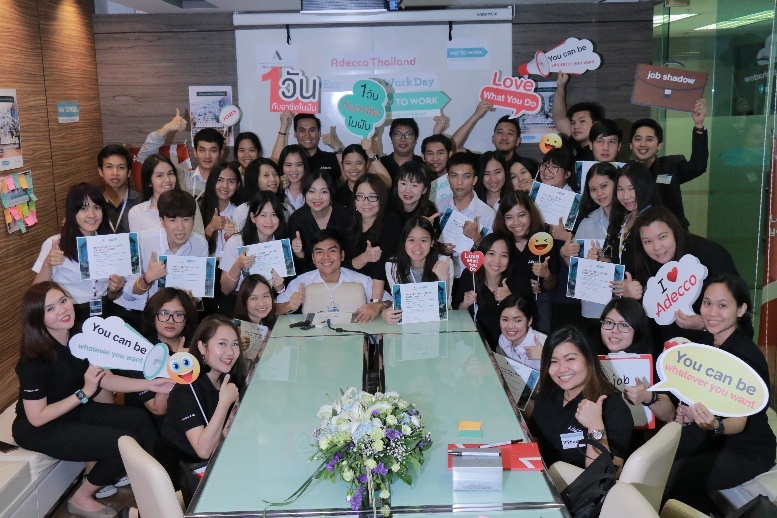 As part of Adecco Way to Work™ programme, Adecco Group Thailand opens ‘CEO for One Month’, now in its fifth year, to search for young talent to step into the shoes of a business leader and provide real-world CEO work experience for one month. This unique programme is a powerful eye-opener and provides a real-world opportunity to oversee internal operations, review business practice and plan, and develop corporate strategy; developing your knowledge and experience while receiving personal coaching from the highly experienced Adecco management team. The candidate will get the chance to become country representative by competing with other young talents to become ‘Global CEO for One Month’ and win 15,000 Euro and the chance to work alongside Group CEO, Alain Dehaze. This is truly an experience of a lifetime and has a long-lasting impact on the individuals who take part. ‘Experience Work Day’ is part of The Adecco Group’s Way to WorkTM. The event is The Adecco Group’s global initiative involved The Adecco Group in 46 countries, all giving their time to helping young people gain experience and improve their job prospects by becoming mentors for one day, sharing their expertise with thousands of young jobseekers looking for advice. Participants have the chance to shadow The Adecco Group employees in the departments and roles of their choice, learn more about their preferred jobs by almost literally stepping into their mentors’ shoes, and improve their skills through workshops and coaching.